Wtoo wedding dresses combine glamorous elements and feminine details perfect for any bridal style. A modern twist on classic and romantic dresses, perfect for any bride who wants a classic yet original look. This elegant gown features an intricate bodice made of several unique laces placed on illusion tulle. Re-embroidered lace jacket with cap sleeves and covered buttons. Exquisitely crafted with all-over Cybele lace, this stunning wedding dress offers glamour and romance in equal measure. A deep neckline with illusion tulle showcases your curves. Narrow, beaded straps give you all the glamour of a strapless gown with the effortless, all-night wearabilty of straps. Delicate lace falls over tulle and stretch poly-charmeuse for a show-stopping effect. In the back, we love the way the silhouette curves before flowing out into an elegant chapel train. 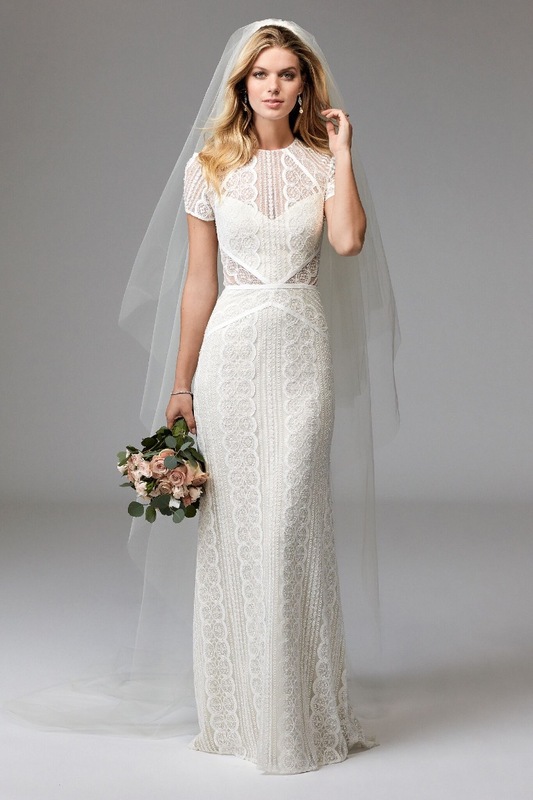 To the bride who loves fine-point lace, we think we’ve found your match. Available beaded or unbeaded. 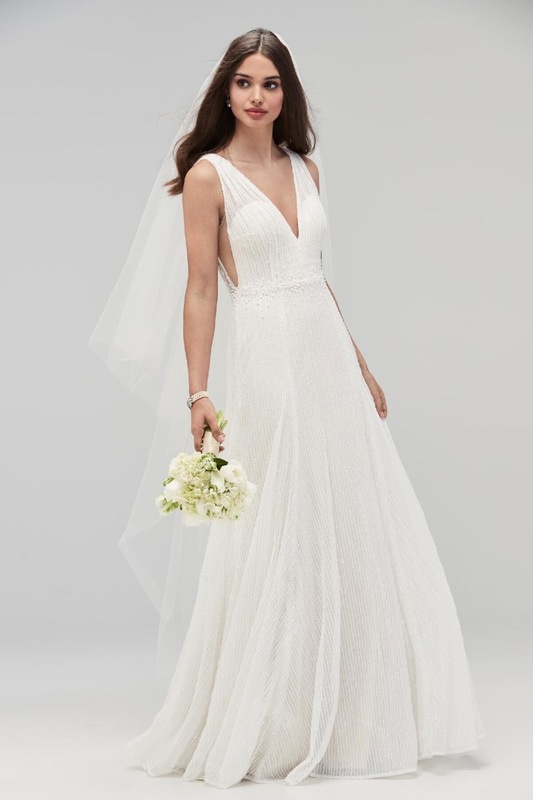 Beaded Reyna stripes on soft netting and illusion tulle make Enid's A-line skirt, plunging back and neckline sparkle with unique detail. Added flourish of pearls at the natural waist gather for a belted illusion. 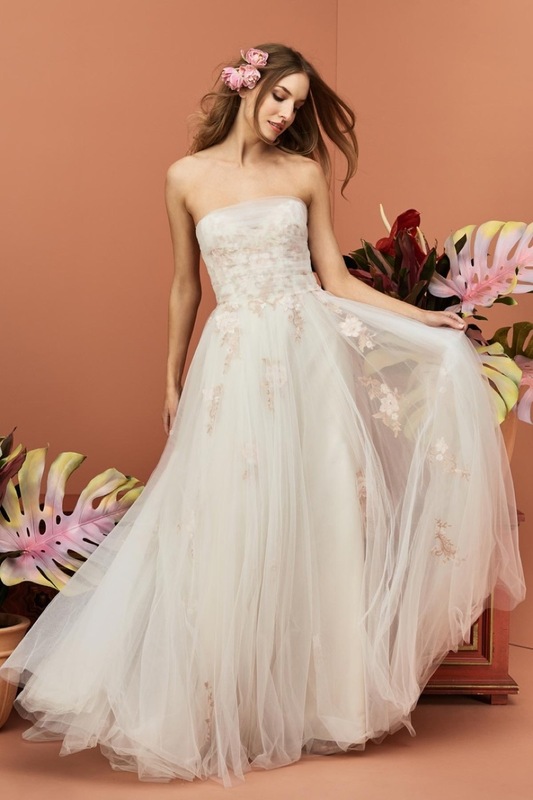 This A-line wedding dress features a bateau off-the-shoulder neckline, corded Alencon lace bodice and sleeves, soft netting skirt, and grosgrain ribbon at the waist. Bring your A-game in this strapless A-line dress that features a Galen lace bodice with a soft chiffon skirt. Designed with a sweetheart neckline then finished with a velvet ribbon sash, it’s got everything you need to look perfect on your big day. This flowing A-line dress features a Tala lace bodice with a soft netting skirt, a stylish V-neck, and pearl button details. For the bride who loves a polished look, Lenora is the answer. Boasting our classic Circle Lace, Lenora features a high neckline with cap sleeves. Thoughtfully-placed trim and cutouts contour the body while the open keyhole back adds a modern twist. Puddle Train. MSRP reflects beaded style. Also available unbeaded. Amp up your #aislestyle with an entirely custom ivory and almond gown designed to stun. Low-cut in back, it blooms all over with floral lace from semi-sheer bodice to cathedral train. Rowena is a bride's fairytale dream come true. Its corset-construction bodice with clear sequin beads and hand-placed Samira Lace is paired with a horsehair-trimmed skirt. Rowena is finished with a double-faced satin ribbon belt. Sweep Train.